One time overage charges will now display properly in the Customer Portal. Payments in the portal will no longer in some cases show an inaccurate amount of $0 on the success page. Resolved several issues that were preventing Saisei from completing synchronization. Updated the remote patch location, which will resolve issues seeing outdated or old patches. When scheduling an upgrade, Beta customers may have experienced an issue where the upgrade would be scheduled immediately. This has been resolved, and upgrades will schedule and run at the correct time now. Updated the equipment form to properly show options when modifying a device configuration template file. The inventory popup will now show pagination, to properly navigate through all available inventory items. Inventory popup has been adjusted to scroll more easily, especially on lower-resolution screens. Resolved a problem in which the IMSI wasn’t being set when editing a piece of equipment. Custom Fields will now populate again on the Equipment form. Saisei BMUs should no longer unintentionally kick into an Out of Sync status. MikroTik interfaces for mirrored BMUs will now save properly. Some Saisei-specific graphs weren’t matched correctly with their Customer Portal configuration settings, we’ve re-matched them to activate properly. Unselectable services will no longer show up when applying a one-time service or charge. Firefox CSV exports will now export with the correct name and extension type. No more ‘bin’ file downloads. New Report Access Logging – we’ve added logging to reports to log web user access to those reports. Access logs can be found under Reports -> Report Access Logs. Customer Logs Report ‘More Info’ has been enabled as a filterable column. Despite having 77 pre-built reports, dashboards and other business intelligence metrics already available in the ‘Reports’ tab, sometimes you just need more data. Luckily Powercode records nearly everything that happens in the system. 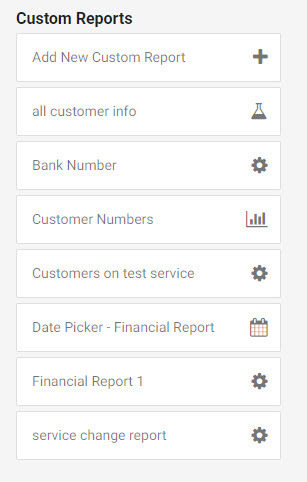 So if you’ve ever caught yourself thinking “it would be great to see the data on this type of customer for this service with these characteristics” we can give that (or just about anything else you can think of) to you through our ‘Custom Reports’ feature. From the “Add New Custom Report” button at the top of the Custom Reports’ header a MySQL query can be entered with the choice between a standard report or a report with an address range or date picker. Then anytime you or an employee need to access that data, just click on the report that was created. You’re welcome to write your own reports in MySQL or you can call or email support and we are happy to build the report you need for you! Initial deployment and support of IPv6 for MikroTik within Powercode. Documentation will be released shortly. New Equipment Form for tracking and handling IPv6. Added the ability to set a custom total queue when PCQ is selected. Non-service APs can now have leases. You can now select total-queue for PCQ. Removing a price override sometimes set the override incorrectly to $0. This has been fixed. Deleting credit cards now shows the last 4 digits to verify the correct card is being deleted. 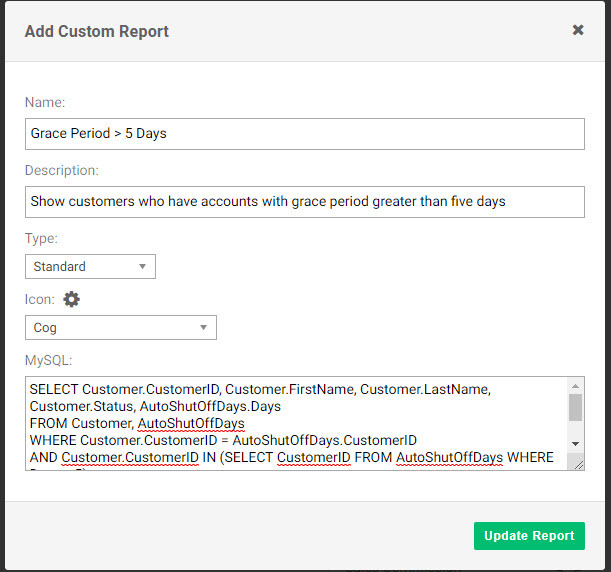 Setting grace periods was sometimes trying to reactivate customers twice, they will now only be reactivated once. When billing with IPPay for the first time, an issue where check numbers could bounce back as invalid has been resolved. Fixed various points in Invoices where foreign characters were not being encoded properly. 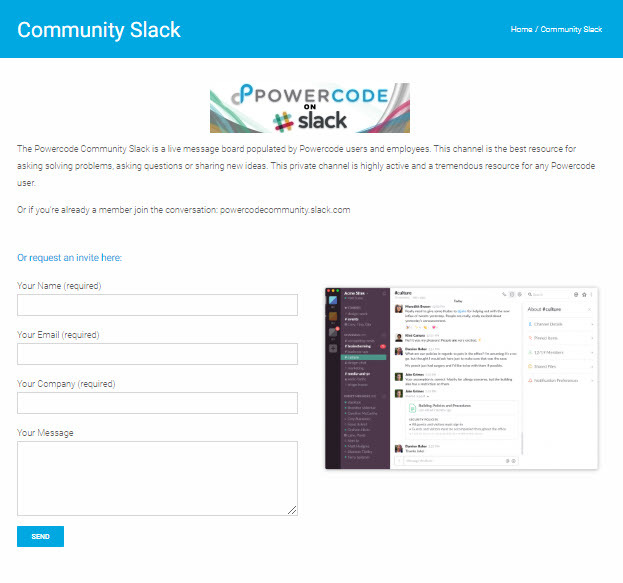 Application lists will now be pulled directly from powercode.com, to ensure it is always up to date. 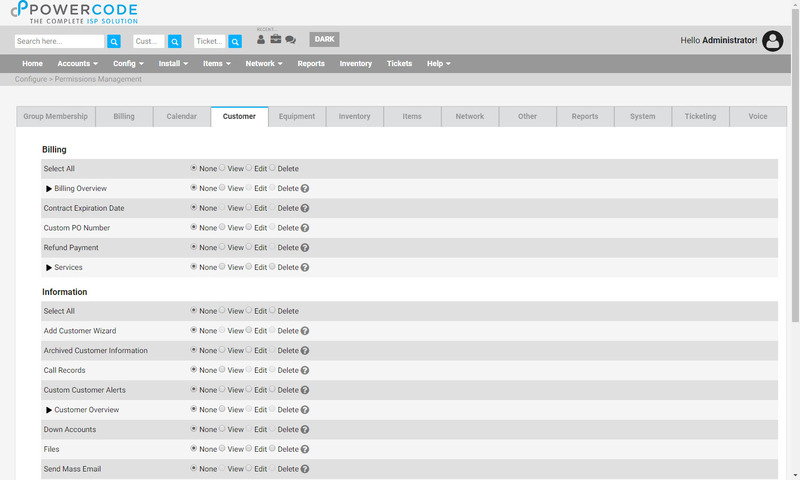 Equipment probes can be enabled through the Customer Portal configuration, and viewed directly on the Customer Portal. Multiple customer portal graphs for Saisei have been fixed and will now display correctly. New Default Login page allows you to configure which page you want customers to be redirect to when they log in. Port specifications will now be saved correctly. SNMP OIDs will no longer save as the “Last Result”. You can now search for Equipment by EquipmentID and be directed to the equipment page if a match is found. Added the ability to search by Transaction ID. Added the ability to search by IMSI. Added the ability to search by the last 4 digits of a Credit Card. There were some cases where data would display even if it didn’t exist, these have been resolved. 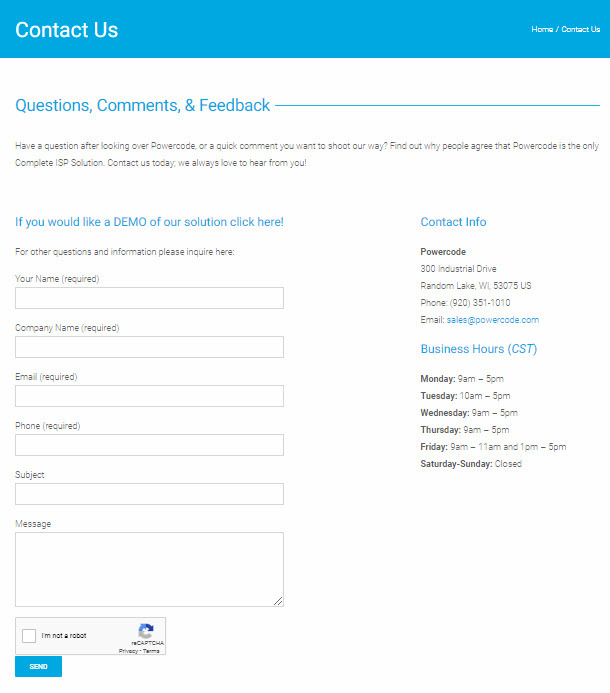 Added the ability to create and require security questions to be answered when creating a customer account. When sending an email to an individual customer, the “From” address will now pull from the appropriate Multi Brand Company. We resolved an issue where some job variables were not populating when sending out a Twilio message. Loading and saving available patches will now work as intended. Customer Tax Zones will now properly be set when updating a customer through the API. 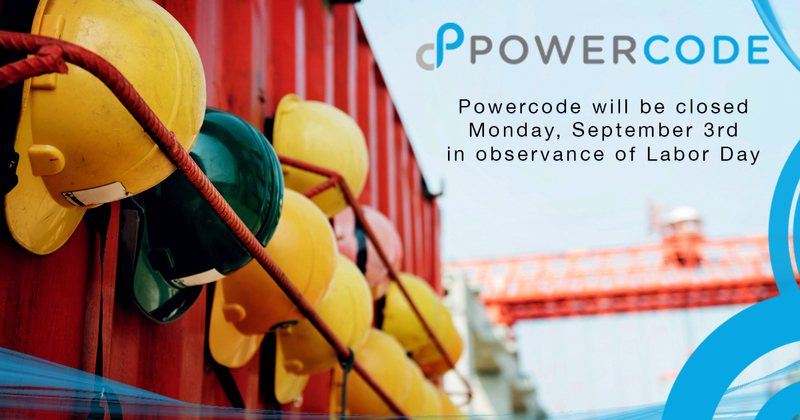 New Powercode Patching system. 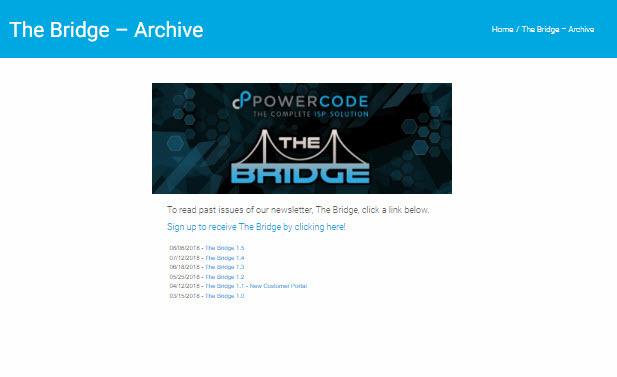 Within Powercode on the Upgrade page, you can now install Patches that have been deployed by Powercode. New patches will appear once they become available, and will be able to be applied to your Powercode system with the click of a button. With this feature, you will no longer have to wait for a release or even have to perform a full upgrade to your system just to get minor bugs fixed. 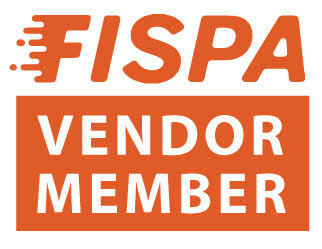 As soon as we fix and verify internally, they will become available to you. 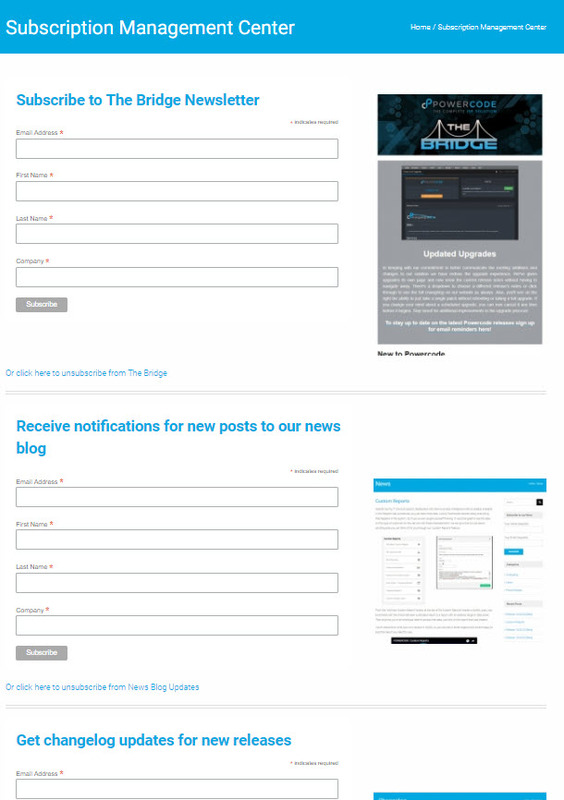 New Powercode Upgrade page. The redesigned upgrade page now allows you to load current and most recent patch notes directly on the Upgrade page. In addition, you can now Reschedule and Cancel an upgrade that has been scheduled – allowing you maximum flexibility on when your upgrade occurs. PCQ no longer attempts to set the rate to 0 incorrectly. Removed non-limited Equipment from all queues and redirects. We explicitly tell Saisei hosts are NOT dynamic to make sure the STM doesn’t forget which customer the host is assigned to. Updated application signatures and lists. Including much better handling of Microsoft updates. Created a ‘game-downloads’ application group and moved relevant applications into this group to separate game play vs game downloads. MikroTik ‘burst in’ speeds were being confused with max speeds, this has been corrected. Ticketing action buttons will now properly activate on iOS devices. Backups now are configured to be stored for X days, old configurations based on weeks have been automatically converted to the correct number of days. An issue where you were unable to edit Contact’s addresses has been resolved. Credit card automatic payment status now shows on the Customer Portal and is no longer affected by unrelated configuration options. Customer Group has been added as a configurable required field to the Add Customer Wizard. Sending mass notifications now properly loads customers by IP Range. It was previously indicating an incorrect number of recipients. Customer status changes now properly trigger the internal email alert. Download links for files should work correctly now. Deleted inventory locations no longer appear as a valid return location when deleting equipment from a customer. Inventory products can now be sorted by quantity. Added in missing network sites to the multi-day schedule. Tech time sheets will no longer attempt to autofill a date over the date selector. Added a ‘Recalculate Drive Time’ button on individual jobs. Allowing you to manually confirm drive times on a per job basis. Added the ability to customize invoice messages and stub message font sizes. We now avoid a case where you might accidentally refund a single payment multiple times. When setting a Temporary Grace Period for a customer that is already delinquent, the customer’s internet service will now automatically be re-activated. One-time credits should no longer be labeled as Monthly Discounts. Permission groups were not properly being taken into account when applying one-time credits, this has been fixed. The financial dashboard ARPU total was not accounting for 0 cost price overrides, we have updated the dashboard to now account for this. Customer Tax Zone now saves properly when updating a Customer through the API. Updated the way we handle probe responses to resolve issues with Equipment Monitor graphs not displaying correctly. Validation errors now show properly when editing or adding a BMU. The groups tab is no longer persistently hidden when adding new services. Updated services custom fields to fix some display issues. As you’re staring your ISP everyone does everything and people jump in where they can. However as you begin to scale and bring on additional employees, specialization occurs and the more access users have the more problems can happen. You may not want a support agent to be able to apply any credit they want and there’s also areas of our software that many employees probably don’t need to see like the financial dashboard. We have built granular permissions the admin can set so users can access or see only what they need to do their job but not be in areas they don’t belong.